There’s nothing more exciting than having the opportunity to build your own custom, dream home–especially when you’ve found the perfect home builder in Franklin, TN, Brentwood, Arrington and Thompson Station, TN, who will be able to transform your blueprint-vision into a reality. Although the prospect of building a new home can be thrilling, with the large financial investment it requires, it can also be a time of great stress. To ease your stress and worry, never be afraid to ask your home builder or contractor questions regarding the construction process of your new home. Having all the information in front of you will make this process much smoother. Approximately how long will it take to build my custom home? What’s your timeline? When discussing the plans of your new, custom home, you should always ask your home builder for a timeline of events. Since the construction of a new home is a large-scale project, it’s very important for your home builder to be upfront with you on how long it will take to be completed. However, be aware that the timeline of completion is tentative due to unforeseen events: inclement weather, delays with the final inspection/Certificate of Occupancy, or availability issues with flooring, furniture, appliances, etc. Additionally, ask your home builder for a schedule of who will be working on what each week. With a timeline and a proper schedule, you will be able to keep track of the development of your home. Will I be able to visit the construction site? If so, how often? In the building process of your dream, custom home, it’s very important that you visit the site from time to time in order to ensure that everything is being completed up to standard and in a timely fashion. However, be aware that visiting too often can become a distraction to the builders and will only slow down the construction process. It’s advisable for you and your home builder to come up with a schedule of the appropriate times and dates you can visit. Additionally, make sure to always contact your contractor to give him/her a heads up on your arrival, this way they can make sure the site is safe for you to navigate around. Will it be feasible to build my home with the budget I set? Before embarking on the construction of your new home, a reputable home builder will give you their best estimate on how much it will cost to build the home you are asking for. If you are unsure of the budget you need for your home, this meeting will be a good indicator of where you need to stand. However, if you do have a set budget, you’re home buidler will inform you whether or not you need to scale back on a few building requests or if you are in the right ballpark. Will I need to obtain a construction loan or do you finance the construction? Depending on who you hire, there are many companies who will require construction loans from their clients while others will finance the whole construction process. Before they get started on your home, always be sure to ask how the financing for this job will work. When should I have a definite decision on the exterior and interior finishes I would like to incorporate into my new home? Throughout the construction process of your custom home, there will be small decisions that need to be made along the way–the type of roofing tile, siding color and material, flooring, cabinets, etc. When talking to your home builder, he/she will inform you of the best time to have certain decisions made by, so they can be ordered and installed on time. However, it’s very important not to order any flooring, lighting, cabinets, furniture, etc. too early in case there’s an issue your home builder runs into that requires you to put more of your budget in an area of your home that needs it the most. You don’t want your preemptive-ness to run you over-budget. From selecting custom flooring to picking out the perfect shades of paint for each room, there’s a lot of decision-making and dedication that’s put into building a custom home. Due to this, it’s very important for the future homeowners to be as involved as possible throughout this entire process. Never be afraid to ask your contractor and home builder questions you may have along the way. A greater knowledge of the entire process will help to ease your mind and stress and will ensure that your home is being built to your standard. 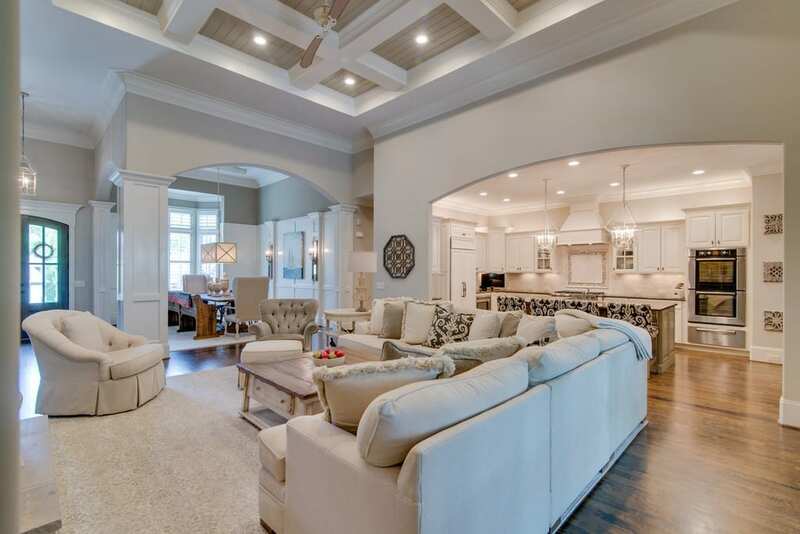 Tennessee Valley Homes, Inc. provides the finest in unsurpassed craftsmanship, innovative design and meticulous project management for custom and semi-custom homes in Franklin, TN, Brentwood, TN, Arrington, Thompson Station, TN and Williamson County. Tennessee Valley Homes is known for exceptional design features that can be personalized to fit each client’s vision. A premier home builder in highly sought after Williamson County, Tennessee Valley Homes partners with top-rated vendors, suppliers, subcontractors and tradesmen to provide the utmost luxury, craftsmanship and character in their homes. Contact us today!